TAKE THE LEAD. Discover the strategy and skills your organisation needs to drive sustainability. Some economists, environmentalists and marketers continue to debate the best way to get society to change behaviours as we adapt to a low carbon economy. Many however have already moved the debate from theory to action with outstanding success by using 9 basic principles. This MasterClass will introduce you to the 9 Global Principles of How to Communicate Sustainability MOSS helped to develop for Green Growth Leaders, the EU Commission, UNFCCC, OECD, Rio 20+ and World Economic Forum, and a new simple 4 step process to create a new sustainability narrative. It will also share best practice case studies; introduce you to new sustainability trends; allow you to learn from both global leaders and your peers and much much more. BOOK YOUR SPOT TODAY to learn from global experts and your peers and fastrack your way to success! Investment: MOSS/ACTS Members: $1,300 Non Members: $1,600. DOWNLOAD BROCHURE HERE. 10% discount for academia, NFPs, government, and small business with a further 10% discount for two or more from the same organisation. 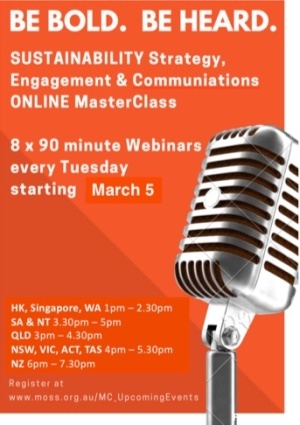 Price includes GST, workbook, participation certificate, access to 8 x 90 minutes webinars and online resource library. CLICK HERE TO BOOK YOUR SPOT TO MAKE YOUR SUSTAINABILITY GOALS A REALITY. This has traditionally been our most popular learning program. If you would like us to deliver this inhouse, then call us on +61 3 987 99886 / +61 419 798b 104 or email us events@moss.org.au today to discuss your needs. Join MOSS as we lead a 5 day Sustainability Leadership Program on Fraser Island exploring how to live and work sustainably from the inside out. So many people today who work in or lead sustainability or who own their own businesses providing green products and or services are burning themselves out. Many have become bored, stale and or disillusioned. Others are just starting their sustainability journey - so join MOSS to discover tools and a framework that will support you and your organisation to THRIVE! ✅ See firsthand how a business can live in harmony with nature and the environment. ✅ Visit a poo farm and discover the secrets to achieve zero waste. ✅ Discover the opportunities (and challenges) of new economic models such as the Blue and Circular Economy. ✅ Learn how to problem solve and unleash creativity. ✅ Discover how to activate more agility and adaptive thinking so businesses can flourish and cut through age old barriers. ✅ Learn how to map forward flows and do what nature does best - adapt. ✅ The what, the why and the how to engage stakeholders to achieve your goals. ✅ Learn a simple 4 step process to articulate a new narrative. ✅ Renew and reinvigorate your relationship with self and others. ✅ Be inspired by the latest global trends, best practice case studies and innovation. ✅ Refocus and rejuvenate your goals, strategy, and enthusiasm for your personal and professional sustainability journey. ✅ Have a rare chance to work on your business not in your business to discover hidden treasures and resources. ✅ Discover the 9 global principles of how to effectively communicate sustainability. ✅ Discover how mindfulness and or connecting with nature can enhance your intuition and productivity. ✅ Swim with humpback whales and discover how communing with nature can shape your purpose and that of your business, and how you live your life. You will learn from global leaders, your peers and nature. Each day there is a mix of theory and practice. Your class room will be the great outdoors and one of most loved eco businesses in Australia - Kingfisher Bay Resort. Who should attend: This workshop is ideal for anyone interested in improving their economic, social and environmental performance - especially business owners and managers, sustainability managers and business advisors. When and Where: Monday 9th September - Friday Sept 13th October, 2019 @ Kingfisher Bay Resort and Hotel, Fraser Island, Queensland. Earlybird: $4,050 twin share $4,450 single supplement - saving $400. Regular Price: $4,450 twin share $4,850 single supplement. Price includes: All meals (including a 5 course Australian Bush Foods degustation experience and accompanying beer/wine), 4 nights accommodation, ferry transfers to and from Hervey Bay, whale watching and swim, 5 day leadership program, copy of "The Blue Economy", workbook, online resource and checklists. Value: Expect to dramatically increase revenues and get greater uptake of your programs - if you apply the principles and frameworks to your business. Best of all you get to go back to work with less stress and more motivation. 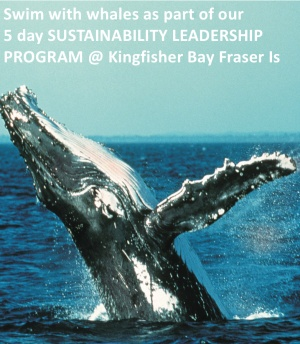 Emerse yourself in best practice, swim with humpback whales, dance with dingoes and dine under the stars in what will truly be one of the best sustainability leadership, strategy and communications workshops ever hosted in Australia. To maximise learning outcomes, this leadership program is for 12 only participants - so provide an expression of interest or book today to avoid disappointment. 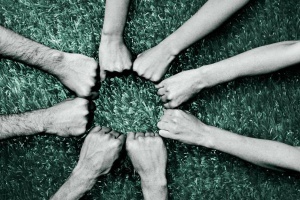 MOSS Member ZOOiD provides organisations large or small, public, private or not for profit, across all sectors, with the tools to confidently take the steps to 1) establish their sustainability strategy and 2) implement and communicate their sustainability strategy using best practice platforms such as the GRI, emerging platforms such as Integrated Reporting and ISO 26000. Join ZOOid for one of the following workshops. Turning Waste into Taste - Discover the Blue Economy Innovation of Growing Mushroom on Coffee (and other waste materials). Receive personalised one on one training at a time that suits you, or join the 5 Day Residential Workshop @ EkofungiSchool in the beautiful historic city of Belgrade, Serbia. European Spring Dates for 2019 will be released soon. Mushroom production is a socially-acceptable and wide-spread biotechnology to convert waste into high-quality food - and where the waste of production can then be turned into valuable high protein fodder for livestock. System Ekofungi are Blue Economy mushroom growing experts who have pioneered innovative mushroom growing techniques like how to grow mushrooms on coffee and other forms of waste - to empower People-Planet-Profit-minded entrepreneurs. Join Mycologist Ivanka Milenkovic and the team at EkofungiSchool in Belgrade for a 5 day residential program that shares the secrets of farming mushrooms on waste products (such as coffee grounds) and the fundamentals to building a profitable, sustainable and rewarding business. For a detailed program, testimonials and registrations CLICK HERE. 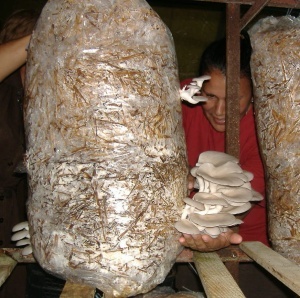 If you are interested in growing mushrooms on waste and can not join a workshop in Serbia - remote bespoke training and mentoring can be delivered via skype/webinar. Email info@moss.org.au or call 04197 989 104 for more details. Al Gore's Documentary An Inconvenient Sequel: Truth to Power makes a great icebreaker for strategy sessions, staff training, community engagement and more. Al Gore say "Now is the time for all of us to fight like our world depends on it." If you want to engage your clients, brief your board, rally the staff or talk to the local community about the solutions to help your business or community transition to a low carbon economy inspired by the work of Al Gore - then talk to MOSS about booking a screening with speaker who has been trained by Al Gore who understands the challenges and the solutions to the climate crisis - that can provide practical solutions to help you, your business and or community to build resilience and THRIVE in this emerging low carbon economy. If you work in or have an interest in Cooling Towers, Waste Water Treatment Plants, Agriculture, Aquaculture, Ice Rinks/Snow Fields, Cleaning River Systems/Ponds - this FREE webinar PODCAST is for you. If you are looking for high-return water efficiencies that also deliver energy savings - then discover proven water efficiency solutions in use by companies like Heineken and Utility Southern Californian Edison. Every industry has technology innovations that take it to a new level of productivity. Silicon chips fundamentally changed the computer industry and digital technology changed the face of photography. This biomimetic technology is now changing how we clean and process water to gain significant water and energy efficiency - and MOSS is delighted to be able to share how you can tap into this game changing Blue Economy technology. Over the last decade Sweden's Watreco has developed Vortex Processing Technology which is in commercial use across Europe and entered the US market in 2014. The technology is an EU Horizon 2020 technology and has been validated by Southern California Edison and US authority Electric Power Research Institute (EPRI). The session includes Q&A with the manufacturer and US implementors including energy efficiency company Cypress and Utility Southern California Edison (SCE). To download the podcast, please register your details - and remember registration is FREE. H2oVortex (the distribution arm of Watreco) delivers solutions that will help you save water, save energy and reduce maintenance costs. H2oVortex/Watreco water treatment prevents and reduces calcium/lime deposits, the biggest cause of high maintenance on installations and machinery which come in contact with water. This reduces the maintenance costs and extends the life of all installations. Cypress has served clients for more than 23 years as an energy-consulting firm that simplifies the development and execution of efficiency and demand solutions for electric, gas and water utilities and their customers. SCE, the largest subsidiary of Edison International, is the primary electricity supply company for much of Southern California, USA. It provides 14 million people with electricity across a service territory of approximately 50,000 square miles. In addition, SCE operates a regulated gas and water utility. Getting diverse stakeholders engaged such as boards, suppliers, employees and consumers in your CSR and or Sustainabilty programs can be challenging without insight into trends and best practice. MOSS CEO Anne-Maree McInerney was involved in establishing the global principles of "How to Communicate Sustainability" and delivers a one day intensive workshop or a two day hands on workshop for organisations wishing to set strategy and communicate their CSR and or Sustainability initiatives. Contact Anne-Maree to discuss the delivery of this workshop inhouse for your organisation. Email: amm@moss.org.au or call 0419 798 104. Want to understand how the Blue and Circular Economy can pay dividends for you, your organisation and your community? Bespoke one and two day programs are now available for business and community groups interested in diversifying their businesses and economies through the Blue and Circular Economy. Discover how to profit from zero waste and support your local community in the process. Contact MOSS on 03 98799886 to discover how we can assist your organisation or community to flourish! If you are not already on the MOSS Mailing list...Subscribe today. Sign up here to be the first to discover the program of events to support you professional development and business growth.